Do you want to create a comfortable outdoor space for your home this fall? You can easily create a welcoming space with retractable awnings. Carroll Awning Company can design high quality custom awnings for your home property or commercial business. What’s so great about retractable awnings? You can setup your awning anywhere, anytime. All you have to do is close up your awning and store when you’re not using it. But which retractable awnings are best for your lifestyle needs – manual awnings or motorized awnings? Manual retractable awnings are awnings where the user must crank to setup or store. Motorized retractable awnings are awnings designed for you to use a remote to electronically roll out or roll up your awnings. You won’t even need to be in the same location as your awnings to operate them. So which retractable awning type should you purchase? A manual retractable awning is great for users that like to get a little workout from cranking. You can use this type of awning anytime because it doesn’t run on batteries or electricity. You can open it up for shade or protection from weather elements like the rain. Best of all manual retractable awnings are very cost effective and easy to install because the manual awnings do not need a power source, meaning less labor for installation. If you are not kin on the idea of having manual retractable awnings, it’s best to go with motorized retractable awnings. These awnings are convenient and make you more likely to use your awnings on the regular for outdoor gatherings or leisure. With Carroll Awning Company motorized retractable awnings; you’ll have reliable awnings readily available. Our motorized awnings can sensor when high winds are present, when the sun is too bright and even identify when a heavy rainfall is occurring. This means all your awnings will open and close when you need them. 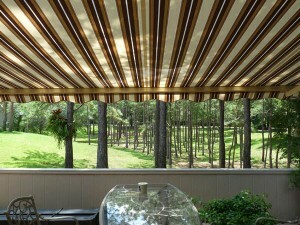 Let Carroll Awning Company enhance your level of comfort and save you money with our custom retractable awnings today. Take a look at our comfortable retractable awnings now. We have a variety of frame colors and awning fabrics available for you to get the look and feel you desire for your property.